CUT-Carefully cut the two white zip ties securing the hose and pump handle with scissors. Use caution not to cut the white hose. SPRAY- Aim wand. Spray by pushing down the white trigger with your thumb. Adjust spray pattern by rotating the white nozzle tip one half rotation. Spray weeds until thoroughly wet. STORE- When finished spraying, push the yellow button and push the wand until the yellow button snaps back into the original storage position. Place the wand back onto the bottle with the nozzle facing down. DEPRESSURIZE- Push pump handle all the way down and turn pump handle and cap counter-clockwise to relieve pressure, then re-tighten prior to storing. Do not spray plants or grasses that you like - they will die. 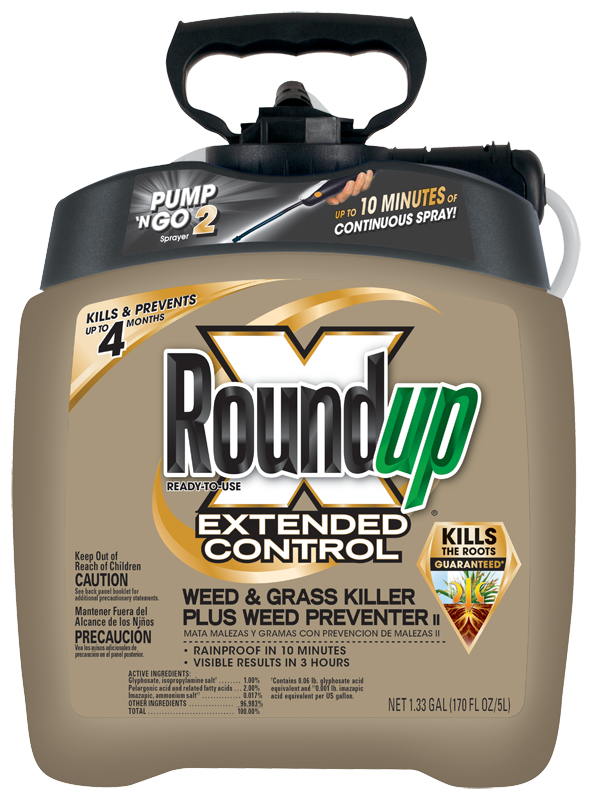 Do not use in lawns or for lawn renovation as Roundup Extended Control products prevent desirable grasses from growing too. Do not use for vegetable garden preparation or in and around fruits and vegetables. Do not spray around young plants or in an area that will be planted or seeded within 4 months. Note: for use in these areas use Roundup® Ready-To-Use Weed & Grass Killer III or Roundup® Weed & Grass Killer Super Concentrate. Spray when air is calm to prevent drift to desirable plants. For fast, visible results, apply during warm sunny weather (above 60 degrees F). Rain or watering 10 minutes after application will not wash away effectiveness. IF EMPTY: Place in the trash or offer for recycling if available. IF PARTLY FILLED: Call your local solid waste agency for disposal instructions. Never place unused product down any indoor or outdoor drain.